Enecsys microinverters are an innovative technology that offer a revolutionary approach to solar PV system design and installation. Instead of having a conventional, centralised solar inverter, Enecsys microinverters are attached directly to the back of solar panels, thereby avoiding one of the most common issues in conventional solar arrays: efficiency loss in an entire ‘string’ of panels due to the shading of just one. Currently, Enecsys inverters are used in Australian-made Tindo Karra 240 solar panels. Update: Enecsys went into administration in Feb 2015. If you are seeking an alternative monitoring solution, read about Enecsys Output. The inverter is arguably the most technologically important part of any solar PV system. The inverter’s role is to convert the DC electricity from solar panels into grid- and household appliance-compatible AC electricity. Most solar systems have only a centralised inverter to which panels are connected, which are susceptible to ‘bottlenecking’ in the production of electricity. 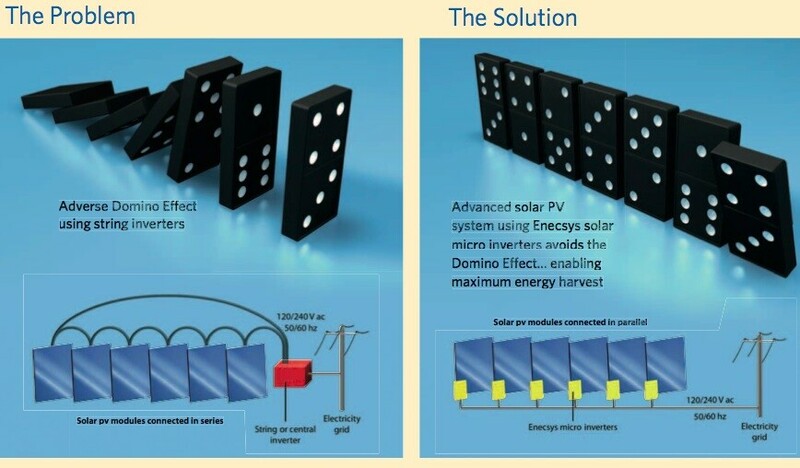 This can occur when individual panels or separate strings of panels in the solar array are shaded, resulting in blockages in the flow of electricity. -Simplified design and installation: Since each panel contains its own inverter, there is no need to be concerned with string layout, special wiring for the inverter, or mixed orientations–panels can be installed at all reasonable orientations, including just one lone panel on, for example, a west-facing roof. Tindo’s Karra 240 solar panels debuted on the Australian market in January 2012, with much media hubbub surrounding the announcement. The panels are being assembled in Adelaide, SA using high-quality components from high-profile manufacturers across the globe, including Enecsys microinverters. Tindo’s panels were recently selected for a ground-mounted installation in Adelaide. Enecsys Limited was founded in 2003 in Cambridge, UK, where its headquarters are situated, after the patented technology was developed at Cambridge University. Enecsys develops, manufactures, and markets high-end microinverters and monitoring systems for residential and commercial solar PV systems, and aims to stay on the global cutting edge of microinverter technology with high-quality components at competitive prices. In addition to the UK, the company has sales and support offices in Redwood Shores, California; Bad Homburg, Germany; and Taipei, Taiwan. Enecsys inverters are available in 15 countries worldwide, including Australia. Alternative monitoring solution for Enecsys Owners who are left in the dark since the company went out of business. I am an Enecsys owner my self and have developed an alternative monitoring solution. Now I want to help out as many Enecsys owners as possible. So please help me to get in contact with the people who have no clue what there solar system is doing. You can try it for free. There is also a demo option. Spread the word, and help the Enecsys owners who are left in the dark. Could you please send through pricing for micro inverters. We are a solar company doing installs in Sydney and are starting to get a lot of enquiries for this product. This article is an old article about Enecsys, who went out of business some time back. We are Solar Choice, not Enecsis – this is simply an article we wrote about them when they were still around. You may want to get in touch with someone at Enphase or APS if you’re interested in sourcing microinverters. Hope this helps – and best of luck. You should make these micro inverters into a DIY plug in inverter for individual panels as there is only one approved plug in type available in Australia that I know of, and lots of illegal units comming in from China. I believe there would be a huge demand for a high quality DIY plug in inverter if the price was right. There are a few other CEC-accredited micro-inverters in Australia, but they’re definitely not dominating the market at this point by any means. We do expect the market for ‘AC solar systems’ to grow well into the future, however.